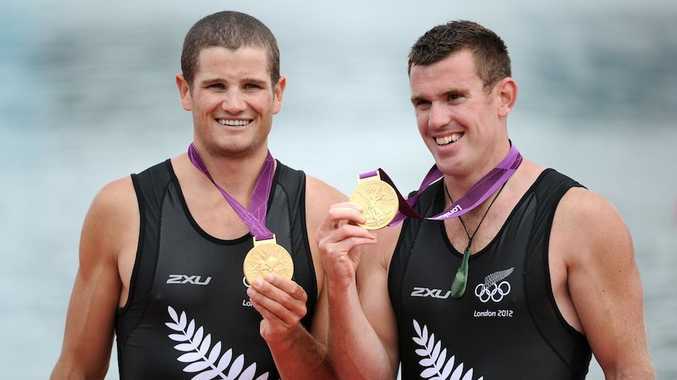 DOUBLE scullers Nathan Cohen and Joseph Sullivan have painted gold on New Zealand's Olympic campaign. The defending world champions won the title with a sizzling second half on Eton Dorney to roar home and collect New Zealand's first gold medal of the Games. Sullivan, sitting in the stroke seat, flung his arms in the air and sank back into Cohen's lap, turned to his right and shook hands with his partner before standing upright in the boat. They are New Zealand's seventh Olympic rowing gold medallists, dating back to the coxed four from Mexico City in 1968. What's more they are the country's first champions in the men's double scull. It means New Zealand have won golds at four successive Olympic rowing regattas after Rob Waddell (single scull, 2000), and the Evers-Swindell twins (women's double scull, 2004 and 2008). Their win follows bronze medals for the eventing team and coxless pair Juliette Haigh and Rebecca Scown 24 hours earlier. The pair are not noted for their fast starts, and so it proved last night. But what counted was what they did in the final 500 metres and, more importantly, all that mattered was getting to the line first. "It was about staying composed and waiting for our moment," Cohen said after the race. "It was nothing new for us. We do a lot of our racing from behind. That's what makes us fight so hard." Having been tardy out of the blocks, Southlander Cohen - at 26, a year older than his crewmate - and Picton's Sullivan were fifth in the early stages and still 3.4 seconds behind early pacesetters Istok Cop and Luka Spik of Slovenia at halfway. But they wound up at the 1500m mark, when they were still fourth. They flew through the field to edge in front of Italians Romano Battisti and Alessio Sartori and power away to win in magnificent fashion. They crossed the line in 6min 31.67 seconds, 1.13s ahead of the Italians with Slovenia third. The manner of victory showed considerable self assurance. They have been prepared to bide their time and set themselves for a hard-charging finish. It's a policy with considerable risk attached. However, Cohen and Sullivan knew their capabilities and back themselves. The result was a spectacular return last night. "That last 500m is where they paid and we benefitted," Sullivan said of the Italians and Slovenian crews. Added Cohen: "We had toughness and belief in each other. We never give up, just wanted to do the best for each other and New Zealand that we possibly could." Both had enjoyed world under-23 success, Sullivan as two-time single scull champion and once in the double; Cohen winning silver in the single seat. The pair first came together in 2010 and prospered immediately, winning the world title on Lake Karapiro that year, and followed it up at Bled, Slovenia last year. In total, New Zealand have won 17 Olympic rowing medals - seven gold, two silver and eight bronze. NZHerald social media editor, Troy Rawhiti-Forbes, who was in the stands at Eton Dorney to witness the race said that New Zealanders in the crowd were hugging, cheering and celebrating as, first, the pair crossed the line and then as they were awarded gold medals in a moving ceremony. He tweeted: New Zealanders are zipping around like the happiest people on earth. More smiles than I've seen away from Disneyland." He said that many New Zealanders are buzzing at news that swimmer Lauren Boyle has stormed her way into the final of the 800m swim, qualifying fifth fastest for Saturday's final and notching her second New Zealand record of the Games. "Everyone's thoughts are also going to swimmer Lauren Boyle," he tweeted on @TroyRF. "Water is NZ's element today." Plaudits have been flowing in from around New Zealand after the win, with many Kiwis taking to social media to celebrate the win. "Who said kiwis can't fly. Well done guys," Theresa Wilson wrote on Facebook. Kate Rollinson said: "That race was so exciting! And just seeing the looks on their faces as they sped ahead. Just awesome." Perhaps the best comment came on Twitter where one commenter pointed out that right around New Zealand there will be excited parents waking up their children to come see the race and the medal ceremony. Earlier in the rowing schedule lightweight men Storm Uru and Peter Taylor went through to their A final tomorrow night, but they won't get one of the favoured two middle lanes. They were seen off by a strong Danish performance from Mads Rasmussen and Rasmus Quist, who won the semifinal impressively and qualified fastest for the final. Uru and Taylor held off Germany for second, and then saw defending Olympic and world champions Zac Purchase and Mark Hunter win the second semifinal with a tidy display to lay out a challenge to the rest of the finalists. The Danes clocked 6min 33.25 seconds, with former world champions Uru and Taylor crossing in 6:36.71, .73s ahead of Germans Linus Lichtschlag and Lars Hartig. "It was a bloody tough race and for three crews out there, their dreams are over for another four years so you've got to be happy," Lower Hutt sculler Taylor said. "We didn't make it this far four years ago so we can at least say we've accomplished something." Single sculler Emma Twigg was safely through to her final, the last 1000m effectively a training row as she, China's Xiuyun Zhang and Dane Fie Udby Erichsen (crrt) were well clear and assured of making the decider tomorrow night. Erichsen won in 7:44.33, with Twigg taking third in 7:46.71. There were tears and bitter disappointment for the lightweight women scullers Julia Edward and Louise Ayling in their semifinal. Winners of one world cup regatta and runners up in the other this season, they arrived in London with high hopes but had them emphatically dashed last night. British women Katherine Copeland and Sophie Hosking dominated the race, winning in 7:05.90 from Greece and Germany, with Edward and Ayling beating home only Cuba, clocking 7:15.06. The coxless four of Tyson Williams, Jade Uru, Sean O'Neill and Chris Harris missed out on their A final, finishing fourth in their semifinal.